Conforzi Biliati recieves money from an alms giver in the street of Blantyre. Government says it wants to ban street begging. Fanny Banda, a single mother of four, cannot walk. She must crawl or use a wheelchair. She said “we face a lot of abuses in the streets. Some people call us names while others scold at us saying, 'Why can’t we stay home and fend for ourselves?'" 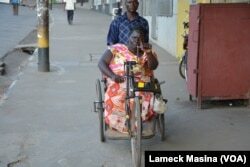 Fanny Banda in the wheelchair, says begging is a humiliating experience but she does it because of poverty.